The Discovery 4 is built with luxury refinement and unstoppable off-road ability by adding extra practicality to give buyers the complete package. This One Off Discovery 4 SDV6 Commercial With 7 Forward Facing Seats (Same As A Car With 7 Seats Stow And Go Third Row and Electric Opening Rear Windows) Covered just 60,000 Miles With Land Rover Service Print Out. 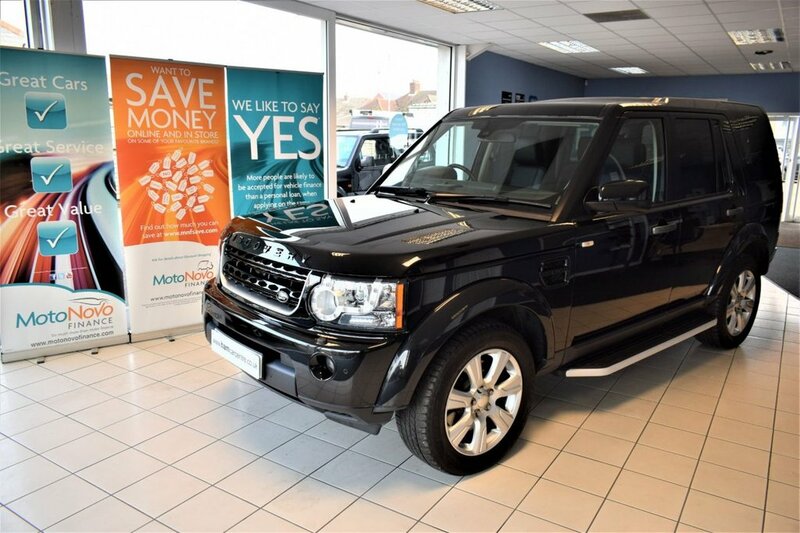 Finished In Santorini Black With Full Black Leather Interior 2014 Model Year Looks With A Black Styling Pack Rear Privacy Glass Side Steps 19" Alloys. (Great Looking Discovery 4 Commercial )You get The Best Of Both,Can Be Used As A Commercial Or Lift The Seats And Used As A Family Car Not only can it accommodate SEVEN adults in comfort, it can also travel at high speed with refinement .This is why the iconic 4x4 has racked up one award after another..Supplied With All Original Hand Books Service Print Out Please Call One Of Our Sales Specialists To Arrange A Viewing/Test Drive.